Book: When The Ghost dog howls. I have and amor this book!. Wallpaper and background images in the goosebumps club tagged: goosebumps. I have and amor this book! This goosebumps photo might contain anime, banda desenhada, manga, desenhos animados, mangá, and quadrinhos. 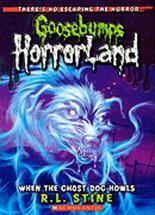 return to panic park goosebumps book? My goosebumps Story: "The Killer Doll"